Tour Historic Georgetown SC! There are museum tours, ghost tours and tram tours in the historic district or take a shelling boat tour to the lighthouse. You won't want to miss the tours in Georgetown. Lowcounty Tours and Rover Boat Tours will take you shelling and out to the lighthouse on their pontoon boats. The Swamp Fox Tours is a one hour historical and educational tour on a tram around the historic district, and if you like to walk, Strollin on the Sampit tours is an intimate walking tour around the historic district. Also, did you know that Georgetown has more than its share of ghosts?! Take a ghost walk at night and enjoy all the eerie and interesting stories. Plantation River Tours, Lighthouse, Shell Island Tours, & Evening Harbor Tours. Shelling and Lighthouse Cruises. Available for special events. Georgetown has been an international port of entry since 1732. Walk with us down along seaport Georgetown’s haunted harbor, where maritime ghosts abound. Beach comb for seashells and driftwood, while enjoying your prepared picnic basket on a remote barrier island accessible to few. Dolphin sightings and bird watching are all part of the island Eco-tour of this uniquely beautiful area of the South Carolina coast. A wonderful walking experience with one of the most knowledgable historians in Georgetown. Embark on an adventure aboard our blue and white tram and hear authentic history spanning almost 300 years and a ghost story or two. Available for special events and weddings. Call Captain Steve at 843-240-0184 about River Tours and Custom Chartered Tours. 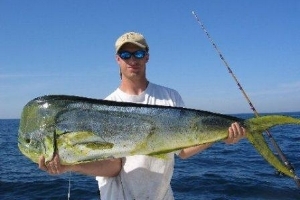 Call Matt Wilkinson for details about his inshore and offshore fishing charters.